a photo from my nutrition textbook, “Wardlaw’s Persepctives in Nutrition” by Carol Byrd-Bredbenner, Gaile Moe, Donna Beshgetoor, and Jacqueline Berning. 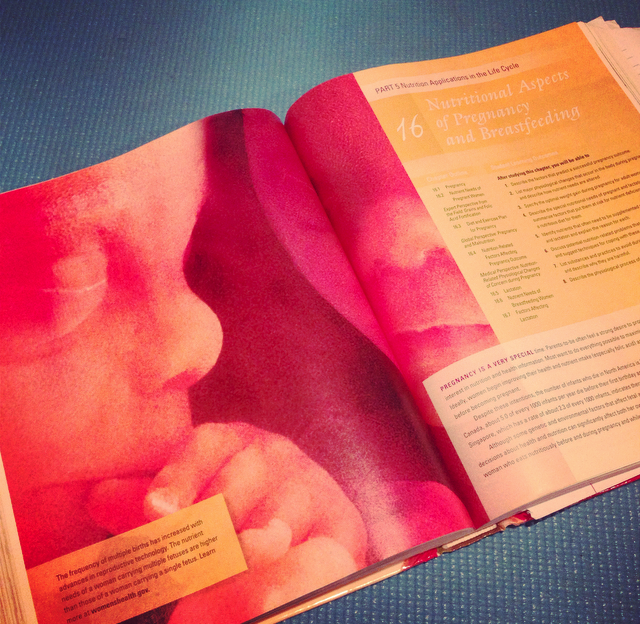 This week in one of my nutrition classes, we covered nutrition during pregnancy. Although I am in no way, shape, or form pregnant, nutrition during that particular life stage has always interested me. If you think about it, everything a mother eats is directly forming the future health of her child, so to say nutrition is important during this time would be an understatement. Although many expecting moms believe they can eat whatever they want during this time, only about 300-400 extra calories are needed, and where these calories are coming from is something to keep in mind. It’s better to eat an extra snack or two of yogurt and granola, or a larger portion of high-quality protein, like a lean cut of steak, than to gorge on cheesecake and chocolate just because you’re “eating for two”. Another particularly interesting thing that we learned is how weight gain during pregnancy influences the developing baby. In the 50’s and 60’s, women were advised to not gain much weight, and it actually ended up being detrimental to their kids. Restricting calories during pregnancy can actually turn on a “thrifty” gene in the baby, which basically means that child is going to metabolize calories in such a way that makes it very difficult to lose weight. Because the baby’s body learns food is a limited resource, they will hold on to fat stores and are more likely to be obese as adults. Some doctors are now advising that pregnant moms who are already obese at the start of pregnancy to not gain any weight at all, and this is a very hot topic of debate. Weight loss during pregnancy is extremely dangerous for the child, because the body starts burning fat and ketones are released. When this happens, the baby is exposed to these ketones and it can be harmful to their developing brains. In fact, babies born to mothers who are in ketosis (the fat-burning process) have been shown to have lower IQs (see the article linked below for more info). In my opinion, women who are pregnant should not become obsessive about their weight, and instead focus on eating a really healthy diet based on fruits, veggies, lean protein, dairy or dairy-alternatives, essential fatty acids (omega 6’s and omega 3’s), and legumes/nuts. Exercise also has so many benefits, especially during pregnancy, but always check with your doctor on whether it’s appropriate. Besides weight concerns, there are several vitamins and minerals that are essential during pregnancy. Iron, which is often low in women as it is, helps form the blood supply of the baby and you may want to have your levels checked if you are pregnant or trying to become pregnant. Calcium is also taken from your body during pregnancy in order to supply the baby’s bones with this mineral, so supplementing with calcium, or upping your intake of calcium-rich foods such as yogurt, low-fat milk, and enriched dairy alternatives may be helpful. Folate, or folic acid, is another essential vitamin that forms the neural tube of the baby. Deficiencies in this vitamin result in neural tube defects, like spina bifida, so it’s imperative that you have good sources in your diet. Good sources of folate include leafy green veggies, black beans, and whole grains, or products made with whole grains. There are so many nutritional concerns during pregnancy that are way beyond the scope of this blog, so if you’re pregnant, trying to become pregnant, or just want to have the best nutritional plan for your future, be sure to consult with a Registered Dietitian and your doctor about what you can do to ensure you’re being the healthiest you can.